Stacked Cinnamon Roll Christmas Tree Recipe Everyone Will Love! Cinnamon roll Christmas tree for breakfast or brunch, is going to be one of the easiest things that you’re going to love making! Not only is great to make to have read for Christmas morning, but you can also use the cinnamon roll Christmas tree as gift to your neighbors and friends! Who doesn’t love the amazing smell of cinnamon, topped with the delicious flavor of the icing on the cinnamon roll pieces? It’s like a perfect little combination of all things happy in one bite. My cinnamon roll Christmas tree is so easy to make! The key to making this is that you DON’T PUT ALL together and then bake it. You have to bake each layer separately, and then stack them up with the icing as the glue. I tried baking all of the layers together, and I totally wasn’t thinking…so it totally failed LOL! That’s okay, the family didn’t care what it looked like. They happily ate every last bite without any type of complaints. Pin this Cinnamon Roll Christmas Tree for later! 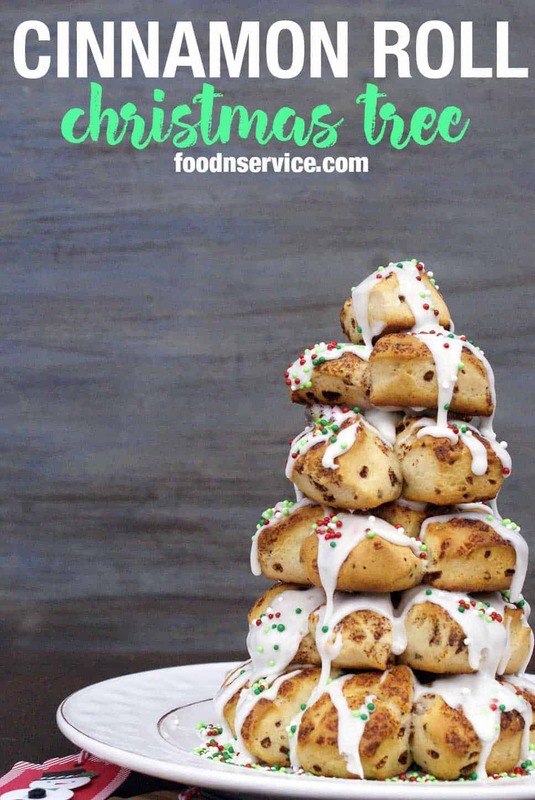 This cinnamon roll Christmas tree is a great way to serve up breakfast or a treat for anyone. Open cinnamon rolls package, and cut each cinnamon roll into quarters. Roll the cinnamon roll pieces into ball shapes. Once rolled into ball shapes, place them into groups of: 10, 8, 6, 4, 3, and 1. Make a circular pattern out of them. For the grouping of 10, place 2 in the middle and the rest surround it. For the layers of 8 and 6, place one in the middle and surround it with the remaining ones. Then join the groupings of 4 and 3 together in their shapes, and the lonely 1 will be by itself. Place them on a parchment lined cookie sheet or a silpat on a cookie sheet. Bake for approximately 9 minutes, or until a beautiful golden brown color. Ice your first layer of 10, this is your base, and then build up with alternating layers and icing. When your cinnamon roll Christmas tree is completely built, sprinkle on your holiday sprinkles. I used Wilton's Nonpariels. If you enjoyed this recipe, then take a look at these other fabulous recipes you might like, too! Thank you so much for stopping by! I’m in love with all things Christmas, Cookies, and Instant Pot. Of course, I love my sister and nephews dearly. If you want to keep up on the latest things from my kitchen and family, then sign up for my newsletter! I’ll even send you a free gift: My Favorite Instant Pot Recipes eBook. It’s my little thank you!